Anyone who missed the hike can always walk the Bayfield Flats this fall. Access to the property is off Hwy 21, just south of the Bayfield River Bridge. Guest speaker Ian Jean, forester at the Ausable Bayfield Conservation Authority (ABCA), shared his extensive knowledge of trees and plant life during the hike. 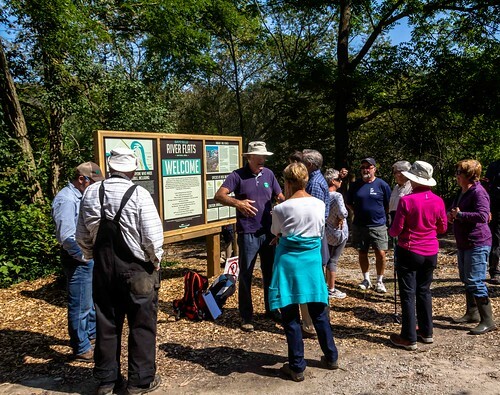 On Sunday, Sept. 10 on a warm late summer afternoon, 25 hikers met at the Bayfield Flats Natural Area to walk the property, learn more about the history as well as recent improvements to the property this year. Guest speaker Ian Jean, forester at the Ausable Bayfield Conservation Authority (ABCA), shared his extensive knowledge of trees and plant life and helped participants discover what’s growing on the River Flats now and what can be expected in the future. He also talked about the Bayfield River watershed (starting in Dublin), water quality and the need for natural forest cover to have a healthy environment. Jean has an amazing knowledge of trees and forests and pointed out many natural features as well as what to look for when identifying trees. He talked about invasive species as well as Carolinian species such as Sycamore trees and Butternut (an endangered species). Other interesting forestry points of interest included looking at the relationship of various tree and plant species along the Bayfield River, their preference for water and or sunlight and the various means that each species distributes seeds. Many dead and dying trees have been cut down, primarily as a safety concern since the property was acquired late last year. Jean noted that this will encourage seedlings, many of which are walnut. 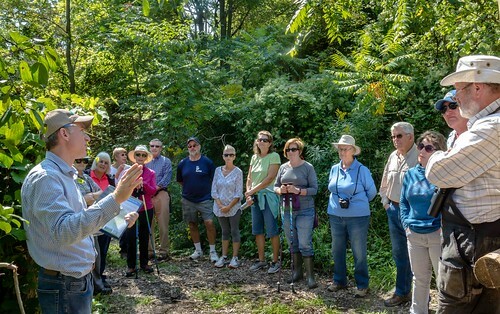 On Sunday, Sept. 10 on a warm late summer afternoon, 25 hikers met at the Bayfield Flats Natural Area to walk the property. Dave Gilllians gave a history of the property dating back to the 1830’s with the establishment of the original dam and river crossing as well as the subsequent mills that were built on the property. Gillians also noted the work that has been done to date including the establishment of a parking area, signage, trails and removal of tons of abandoned steel and litter. The hike was about two hours with stops along the way. Hike leaders from the BRVTA were Peter Jeffers, Dave MacLaren and Roger Lewington. Jeffers, a BRVTA board member, thanked Jean for attending and sharing his knowledge with the group. Anyone who missed the hike can always walk the Bayfield Flats this fall. Access to the property is off Hwy 21, just south of the Bayfield River Bridge. Turn east on the lane almost across from Short Hill Road and down to the parking lot. Suitable footwear is always a good idea and don't forget to bring tree identification books and binoculars if you have them! There is extensive bird activity along the river as well as a colony of beavers. The BRVTA organizes hikes twice a month and all are welcome. Watch for upcoming hikes in the Bayfield Breeze or go to www.bayfieldtrails.com. Brandon Lemieux, an ardent beach walker and cleaner, died on Sept. 16, 2016. His mother Susan wishes to honor his name and asked if Bayfield would be interested in assisting as a result Blue Bayfield, Bayfield River Trail Association, Pioneer Park Association, Love Your Greats, Beach Management Committee, Municipality of Bluewater and the Lake Huron Centre for Coastal Conservation are joining forces to coordinate a beach cleanup to honor Brandon. Interested citizens are asked to meet at the Main Beach parking area at 9 a.m. on Sept.16, 2017. Participants are asked to wear appropriate footwear; gloves and bags will be provided. Citizens in the village have been willing volunteers for beach cleanups for at least 20 plus years. Cigarette butts and fast food containers, including plastics have dominated the collections over this period. Studies have shown that plastics are becoming a major concern in the Great Lakes and that aquatics species are mistakenly consuming plastics that appear to them as food. Forty-five million people also use the lakes as their source of drinking water and a reservoir for sewage, both storm and domestic. Lemieux had visited his great-grandfather’s summer cottage off of Stanley Side Rd 1 since childhood. 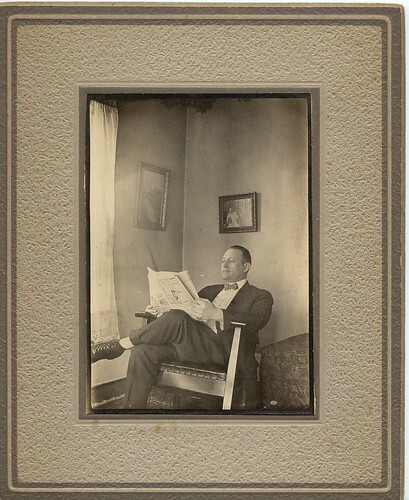 His summers always included trips to the village for ice cream and a trek down to Bayfield Beach for a swim, fishing off the end of the pier, his passion. Later, he worked as a cook in the kitchen of JD's Restaurant. In any season, Lemieux, later living in Seaforth, could be found wandering the Bayfield Beach. 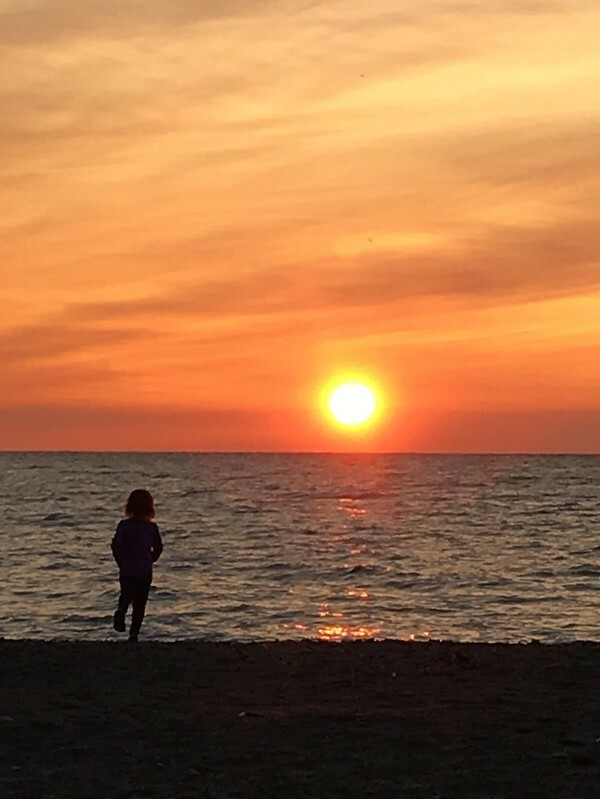 Even after relocating back to his hometown of Kitchener, he made sure his daughter also knew of this special place, a visit to the Bayfield beach was a must each and every summer. He was passionate about the beach and expressed this passion by spending countless hours picking up litter. It was important to him that the beach and Lake Huron be maintained for future generations. Lemieux’s connection to the Bayfield Beach was so strong that he always said that he "felt the most himself there”. All are invited to join in honouring Lemieux’s memory by demonstrating community support for his passion for protecting a most valued resource, water. Photo Tour Trekkers and the Photography Club of Bayfield (PCoB) are pleased to announce the Fifth Annual Bayfield Foto Fest on Sept. 30-Oct. 1. In celebration of this fifth annual event year when participants register for FFF2017 their name will be entered in a draw to win a 2018 Photo Tour Trekkers Franklin Island four-day workshop. 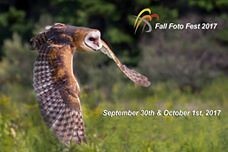 As in the past, Fall Foto Fest weekend will feature a series of workshops that will help to hone photographic skills and techniques. This year the offerings include a choice of six two-hour workshops. New this year, three, three-hour master class workshops will also be held. For Raptors & Birds of Prey, Adobe Lightroom Master Class and World of Macro Master Class workshop there is an additional fee of $30 for both adults and students. Please note Raptors and Master Class workshops are three hours and include hand out material. Adobe Lightroom and Macro are limited to ten people per workshop session allowing for plenty of one on one time and photography. At the time of registration, pariticipants can also book a Saturday evening Fall Foto Fest Buffet dinner at Renegades for $25. Dinner and workshop reservations close at 5 p.m. on Monday, Sept. 25. Grand Prize is a tour package for one photographer to join Photo Tour Trekkers on their May 2018 Italy Photo Tour. There is also a “People’s Choice” award sponsored by The Ashwood Inn (a weekend for two at the Ashwood). All winners will be announced at the Sunday Wine and Cheese event at 5 p.m. Submission deadline for photos is September 15. For details click on the link below: http://phototourtrekkers.com/tours/fall-foto-fest-photography-contest/. The exhibition is open all weekend, but voting by the general public for the People’s Choice Award will take place on Sept. 30 from noon to 2 p.m. and on Oct. 1 from 8:30-9:30 a.m. and noon-2 p.m. so come out, enjoy the photos and help select the winner. Canadian best selling author and international activist Maude Barlow is the keynote speaker at the Bayfield Sustainability Summit, taking place at the Bayfield Town Hall on Sept. 23. Titled ‘Big Solutions for Small Communities,’ the Summit will bring together experts in various aspects of environmental sustainability with a particular focus on how rural villages can make meaningful change in the fight against Climate Change. The National Honorary Chairperson of the Council of Canadians, a citizens’ advocacy organization with members and chapters across Canada, Maude Barlow is also the co-founder of the Blue Planet Project, which works internationally for the human right to water. She chairs the board of Washington-based Food & Water Watch, is a founding member of the San Francisco–based International Forum on Globalization, and a Councilor with the Hamburg-based World Future Council. In 2008-2009, she served as Senior Advisor on Water to the 63rd President of the United Nations General Assembly and was a leader in the campaign to have water recognized as a human right by the United Nations. Barlow is a prolific author; her most recent book, “Boiling Point: Government Neglect, Corporate Abuse, and Canada’s Water Crisis”, builds on a trilogy of treatises on global water issues: Blue Future, Blue Gold and Blue Covenant. Joining Barlow at the podium and around the discussion table will be: Tom Davis, a professor in the Donald J. Smith School of Building and Technology; Detroit Zoo CEO Ron Kagan; Bayfield’s own Jennifer Pate, a geographer, filmmaker and adventurer; Mari Veliz, the Healthy Watersheds Supervisor at the Ausable Bayfield Conservation Authority (ABCA); and Philip Keightley, M. Sc., P. Eng, of Bayfield, a professional engineer with more than 40 years of experience specializing in water and sewage projects. 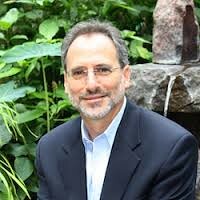 Detroit Zoo CEO Ron Kagan will highlight the Zoo’s sustainability projects, current and future, including their Anaerobic Digester that converts ‘poo at the zoo’ into compost and methane byproduct. The Zoo has also successfully weaned its visitors off single use water bottles, and is looking to install Tesla solar roof tiles in the future. Kagan’s informative presentation will offer suggestions as to the ways in which municipalities and universities can create less waste and lower their energy use at the same time. Jennifer Pate is a geographer, filmmaker and adventurer with a BA in Geography and an MSc in Environment, Science & Society (with Distinction) from the University College of London, UK. Her academic research explored environmental management and experience; film as an emancipatory tool for environmental education; and geographies of health and biological identity. In 2009, she led an UCL-funded research expedition to British Columbia, and in 2010, was a member of the Lost World Project documentary-making expedition to Venezuela’s Mount Roraima. In 2014, Pate sailed across the Atlantic from Lanzarote to Martinique with an all-female team called eXXpedition. The 40-minute documentary “eXXpedition: Making the Unseen Seen’ which resulted premiered at the Royal Geographical Society in London (UK) in 2015. When not working with eXXpedition, Pate is creating huge waves of her own at her environmentally sustainable outdoor recreation park in Bayfield called Windmill Lake Eco & Wake Park. 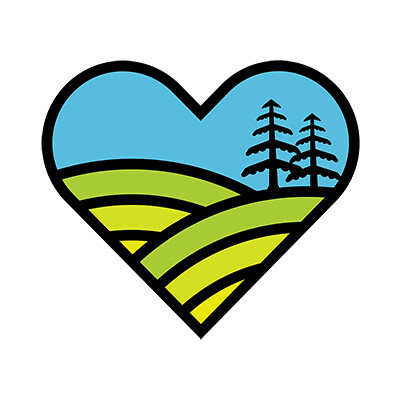 In her presentation, Pate will share a love story – a unique tale of people’s passion for their local waterways and their willingness to instigate meaningful change for a healthier future. Join her for a journey through the intersection between environmental degradation and optimism. 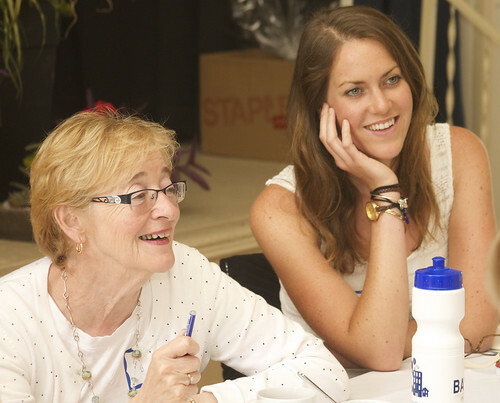 Blue Bayfield is an organization of concerned citizens who reside in the Bayfield area. Its mission is to reduce the use of disposable plastics and prevent plastic and pollutants from entering the Great Lakes and waterways. Blue Bayfield is responsible for installing multiple water bottle refilling stations throughout the village, providing a mobile water unit at events and locations where no potable water is available, hosting and participating in beach and park clean ups, educating the local community on this important topic and encouraging action. It works alongside many other local community groups, businesses and government to help create a sustainable environment from land to lake. The Bayfield Town Hall and Blue Bayfield are pleased to co-host Trent Severn, a Canadian folk trio composed of Emm Gryner, Dayna Manning, and Lindsay Schindler. Founded in 2011, all three women share vocal duties and contribute to the songwriting process. Trent Severn is an acclaimed Ontario folk trio who sing original, contemporary songs described easily as “Canadian History in Harmony”. Topically modern with a humorous twist, Trent Severn have inspired audiences all over Canada to share a patriotic laugh and let their glowing hearts melt away. Continuing the deeply poetic legacy of true ‘red and white’ pioneering troubadours such as Stompin’ Tom Connors, Ian and Sylvia Tyson and Gordon Lightfoot, the eminently talented Southern Ontario trio planted their Maple Leaf flag deeply in the firmament of the Canadian roots music scene with the release of their self-titled debut album in 2012. On March 15, 2013, they became the first band to receive a phone call to a concert from space, when they played a live song for Commander Chris Hadfield while he was on the international space station. On Canada Day of that year the band was part of Hadfield's first performance back on earth, of "Space Oddity" by David Bowie. The Bayfield Sustainability Summit: Big Solutions for Small Communities will be held from 9 a.m.to 5 p.m. at the Bayfield Town Hall. The cost to attend is $50 per person, and allows you to save $5 off the price of your concert ticket. Register at eventbrite.ca. Even if you are unable to attend the Summit, you can still enjoy this amazing concert, which takes place at the Town Hall on Saturday, September 23 at 7:30 pm (doors open at 7 p.m.). Tickets are $25 in advance, and $30 at the door. To buy tickets, call Shelagh at 519 565-2572 or Mark at 519 521-2994. An online petition has been created regarding the proposed development at 89 Main Street South in the village. The petition entitled, “Preserve Bayfield, Ontario's heritage culture - say "NO" to corporate encroachment” that will be sent to the CAO of the Municipality of Bluewater Kyle Pratt. It was launched midday on July 11 and as of publishing time had generated 643 signatures. For anyone interested in viewing the petition please visit: www.change.org. Anyone who missed Valdy’s sold-out performance in 2016, only a few tickets remain for this year’s concert. 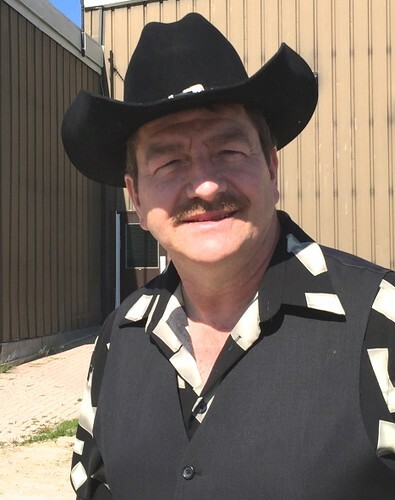 Valdy has sold almost half a million copies of his 13 albums, has two Juno Awards (Folk Singer of the Year and Folk Entertainer of the Year), a total of seven Juno nominations and four Gold albums to his credit. He’s a singer, guitarist and songwriter who catches the small but telling moments that make up life. Go to www.valdy.com to preview his music. The concert will take place at the Bayfield Town Hall on Thursday, Sept. 21, at 7:30 pm. Tickets are $30 and can be purchased by calling Sandy at 519- 565-2830 right away. Fall is a great time to visit the Bayfield Farmers' Market. Not only is it the best place to find fresh local food, it will also provide a showcase for fantastic local music this September! Bayfield's own Josh Geddis will be featured on Sept. 15. The Cultural Collective Jazz Band will keep toes tapping on Sept. 22. The music on both dates will begin around 4 p.m. The Bayfield Farmers' Market runs Fridays from 3-7 p.m. in Clan Gregor Square until the Thanksgiving weekend. The Bayfield Garden Club welcomes all to attend our next meeting on Monday September 18th at 7:30 Pm at the Bayfield Lions Building in Bayfield. Calling all novice and experienced gardeners. Fall is in the air and its gardening time again! The Bayfield Garden Club welcomes all to attend their next meeting on Monday, Sept. 18 at 7:30 p.m. at the Bayfield Lions’ Community Building in the village. Know any good gardening tips for the fall season in the garden? Need some gardening advice? Join us for our Question and Answer meeting. All are welcome to bring garden questions and join in with the discussion. This is a great time to find out best gardening advice for the changing seasons and to learn gardening tips from fellow gardeners. Examples of questions that may be discussed include: When is the time to prune shrubs and roses. How should you prepare garden beds for winter? Can you still plant shrubs and perennials this time of year? Refreshments and draw prizes will also be a highlight of the evening. "Be strong for others" and "Bury your feelings". “The Grief Recovery Method” is a Grief Support Group that in eight weeks can change a person’s life. This Action Program is for moving beyond death, divorce and other losses. Whether a person is experiencing loss from death, divorce, loss of job or childhood issues (recent or in the past), recovery is possible. This program will be held in Bayfield from Tuesday, Sept. 26 to Nov. 14. It will be held at Bayfield Public Library from 7-8:30 p.m. The cost is $35 for the resource material. Participants must pre-register. The program will also be offered in Wingham, ON, at Sacred Heart Elementary School starting on Sept. 27 to Nov. 15 from 7-8:30 p.m. Please call Huron Hospice to register, 519 482-3440 Ext. 6301. Hundreds of thousands of people across Canada are expected to participate in the Annual Terry Fox Run on Sunday, Sept. 17, a fundraising event taking place in over 700 communities that continue to embody the indomitable spirit of Terry Fox. “In a year where we have enjoyed celebrating our country’s 150th birthday, it’s been great to hear so many Canadians say that participating in the Terry Fox Run in an important part of the celebration,” said Terry’s older brother Fred Fox. Terry was just 18 when he was diagnosed with a cancerous tumor in his right leg. He was in his first year at Simon Fraser University studying kinesiology when he felt the pain in his knee. He had his leg amputated six inches above the knee and endured aggressive chemotherapy to eliminate remaining cancer cells. During his treatment, he witnessed daily reminders that two-thirds of cancer victims died of the disease. Instead of crushing his spirits, the sight of other patients suffering made him stronger and more compassionate. It was from this strength and compassion that the Marathon of Hope was born. Since Terry ran in 1980, Canadians have raised over $750 million for cancer research. This money is invested into projects with the greatest potential impact for patients. One such project is Multiple Myeloma Molecular Monitoring, underway in Vancouver, Calgary, Toronto and Montreal. A team of researchers will work with more than 250 patients across Canada to advance the ability to characterize and monitor multiple myeloma in the blood and the bone marrow to better understand how current treatments work and develop new, more effective ones. This year hundreds of thousands of Terry Fox supporters, family and friends, will participate in a favourite Fall tradition to ensure that cancer research continues to make a difference. From coast to coast, Canadians will be celebrating the power of the human spirit. Members of the Bayfield River Valley Trail Assoication (BRVTA) organize the annual village Terry Fox Run and this fundraiser for cancer research will be held on Sept. 17 starting at 9 a.m. from Clan Gregor Square. The West Coast Astronomers (WCA) next Star Party is Wednesday, Sept. 20 at the Agricultural Park in Bayfield. Each party is limited in the number of participants the group can accommodate. Please use the RSVP button on the 'Star Party' page to reserve a spot. If the sky is not clear on the designated night, the event will be cancelled and no one will show up. If you have doubt on the status of the event please call 519 868-6691. If you are an amateur astronomer, willing to bring your telescope, and share your knowledge with others, please contact the number listed above in advance. Visit www.westcoastastronomers.info for more details, locations and times. 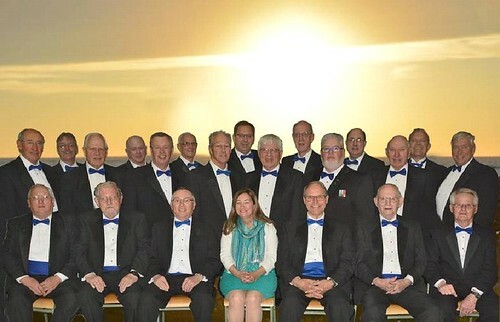 “The Music of Canada” is the theme of the evening to celebrate the 150th birthday of this country as well as the 70th anniversary of The Goderich Harbouraires choir. Sept. 24 is the date set for the concert that will be held at St. Andrew’s Church starting at 7:30 p.m.
Tickets are available now by calling John Davies at 519 565-2813 or from any choir member. The Bayfield River Valley Trail Association will be holding a Fall Harvest Dinner and Dance on Saturday, Oct. 14 at Renegades Diner in Bayfield to celebrate the Trail’s 10th Anniversary! Tickets are $40 and the evening starts with a Reception and Silent Auction at 6 p.m/ with dinner at 7 p.m. After dinner, those who attend can dance to the live music of “The Saxman”. The BRVTA has been actively building and maintaining a network of trails in Bluewater over the past 10 years. These trails, built entirely by volunteers, are for public use by local residents and tourists alike thanks to a partnership with the Municipality of Bluewater and the generosity of private landowners. Over the years the BRVTA has contributed much to community improvement through fundraising. Sponsorship of the Terry Fox Run for the past 8 years has raised over $30,000. An additional $1,000 was raised for the Goderich MRI Imaging project and $1,200 for the Clinton Hospital. 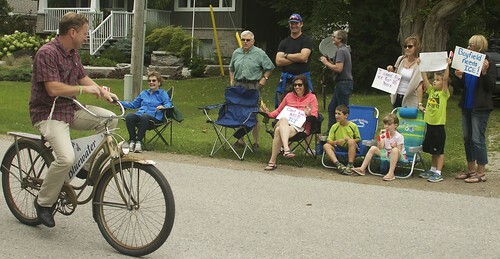 In 2013, the Festival of Fitness and Art in Bayfield used the trails and raised in excess of $4,000 for the Alexandria Marine and General Hospital in Goderich. “We are most proud of the initiative to purchase the Bayfield Flats Natural Area for the enjoyment of future generations. 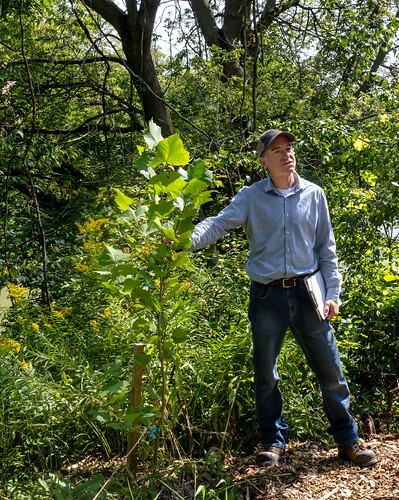 In 2016, the BRVTA coordinated a fundraising drive to purchase the property on the Bayfield River and donate it to the Huron Tract Land Trust Conservancy. This was an amazing project, thanks to the incredible support of the community,” said Roger Lewington, a BRVTA member. The trails are free of charge to the public and provide a superb opportunity for families and people of all generations to enjoy the beauty of our area. Members hope that people can come out for a wonderful evening and support the Bayfield Trails and the 10th anniversary celebration. Tickets can be purchased by emailing info@bayfieldtrails.com or by calling Roger at 519 565-2202 or Scott at 519 565-2827. Tables of eight or 12 can be reserved. September is the perfect time to explore the trails in the Bayfield area and members of the Bayfield River Valley Trail Association (BRVTA) have some great, guided hikes in the works! As the month comes to a close the BRVTA will host a hike on the Lobb Trail starting at 9 a.m. on Thursday, Sept. 28. The Lobb farm is a heritage property. The Lobb trail is beautiful with several riverside locations, some hills, scenic rest stops and some heritage interpretation plaques. The nature trail winds over an old pottery kiln and through a homestead area. The trail is approximately 7 KMs long and passes through mature woodlots with a variety of tree species. It is considered a level 3 trail with some hills, on a natural path. The bridges may be slippery when wet and there is one steep embankment with gradual slopes in two sections. The trail is located on Maitland Line. To get to the trailhead turn north/north east at Holmesville off of Hwy. 8, on to Sharpes Creek Line. Turn north/north/east on to Maitland Line. Parking can be found at the intersection of School House Rd. The hike leader will be Peter Jeffers 519 933-4555. Such is the epitome of a new Guiding season. Sparks, Brownies and Guides in Bayfield will resume on Wednesday, Sept. 20 at 5:15 p.m. until 7 p.m. at Trinity Anglican Church. The Pathfinder and Ranger group will be starting soon too! Girls aged five to 17 are welcome to join and they can register online now at www.girlguides.ca, clicking on Registration and entering the “N0M 1G0” area code. Bayfield Guiding has had a presence in this community for 60 plus years, Want to learn more about Bayfield Guiding? Contact Melody Falconer-Pounder at 519 525-3830 or melody.pounder@gmail.com. On Aug. 29, the Bayfield Facilities Initiative Team (BFIT) and the Bayfield Arena Community Partners Association (BACPA) together submitted a letter to the Mayor of Bluewater and his council to advise the Municipality of Bluewater of their interest in the operation of the entire Bayfield Community Centre. Rebecca Merner walked with members of the Bayfield Skating Club during the Bayfield Community Fair Parade in mid-August to let people know that ice users are opposed to the decision to permanently remove the ice from the facility in the Spring of 2018. They then requested that council include prices in their response so that both the organizations would be advised of what council’s expectations would be going forward. This motion was passed with Bayfield Ward Councilor Bill Whetstone and Zurich Ward Councilor Janisse Zimmerman voting against it. The motion was made following presentations made by BACPA and BFIT to council members in front of a gallery filled to capacity with people opposed to the ice removal. Ron Keys and Karen Morrison presented on behalf of the BACPA while Steven Baker and Sandy Scotchmer spoke on behalf of BFIT. 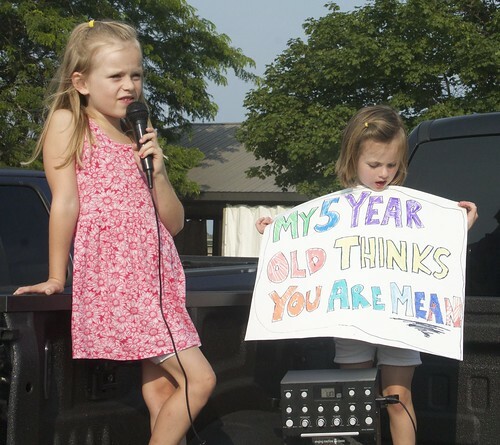 Young ice users gathered with their parents in the parking lot at the Stanley Complex in Varna as Bluewater councilors gathered for their meeting on Aug. 21 to let them know that they are opposed to the permanent removal of the ice. The BACPA was formed in January 2014 in an effort to dissuade the Municipality of Bluewater from removing the ice that spring. Their mandate is to inspire healthy living through a multi generational facility that puts physical, educational and social activities under one roof for an entire community to enjoy. They asked for three years to prove that the ice surface in the arena could be better utilized. Numbers calculated by the municipality and the numbers crunched by BACPA show some discrepancies in operating deficits. 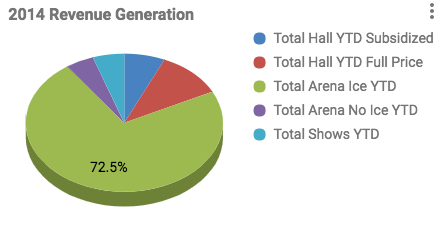 Keys noted that the hall usage is highly subsidized which contributes to the overall deficit of the facility. 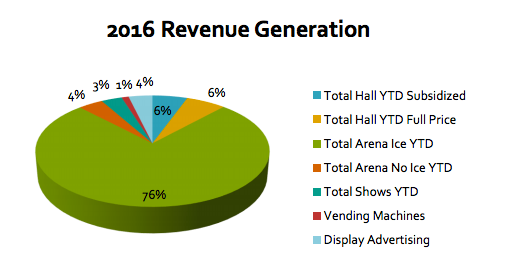 “Our data indicates that revenue from the ice is up, not down. As far as the numbers that have been reported to us it appears that the arena deficit is calculated as a whole and that the municipality calculates revenues based on weekly usage ice contracts and does not factor in one time rentals and other uses of the ice onto the revenue side of the balance sheet,” Keys said. 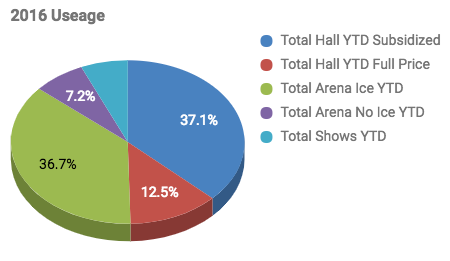 BACPA believes that currently the billed use of the ice is almost equal to the subsidized use of the hall. After both delegations had presented the treasurer for the municipality explained that she had determined the deficit for the facility to be $69,133.31 while the total operating costs were $131,848.18. Morrison spoke to the added attractiveness of the community by having ice in the arena in winter. “In winter the ice pad is the centre of many community activities, which promote our sense of community and improve our quality of life. These can’t be measured on a balance sheet,” she said. She sited the benefits of offering public skating, sponsored at no cost to residents, as an all-ages activity. She also noted that the Bayfield Skating Club had about 50 youth members last year and even offered adult skating lessons. She noted that these recreational offerings were made popular by the fact that people can walk to the arena. “In fact, research shows that the farther one has to travel the less likely people are to take part in leisure activities like this,” she said. She noted that the BACPA has sponsored and supervised shinny hockey for youngsters who would like to play hockey but can’t necessarily afford the costs of playing in a formal league and that this opportunity has proven extremely popular and is not offered anywhere else. She explained that the BACPA also organized both Tyke Hockey tournaments and Over 50 Hockey tournaments in the winter months that not only generated funds for the arena but also brought much needed business to the stores, hotels and restaurants in the village during the low season. Morrison encouraged council to keep the ice in while an independent feasibility study is conducted. “It doesn’t seem to make sense to get rid of the ice, then decide what to do with it. At least the ice is generating some revenue, rather than sitting empty while waiting on the results of a feasibility study,” Morrison said. When BFIT representatives, Scotchmer and Baker, took to the microphone they both expressed disappointment that council did not appear open to their request to allow the BACPA to market the ice for another three years while their group worked to come up with a plan for a new community facility. Baker noted that Bayfield is not just an aging community. On the evening of Aug. 21, the Municipality of Bluewater Council voted to permanently remove the ice from the Bayfield Arena in the Spring of 2018. 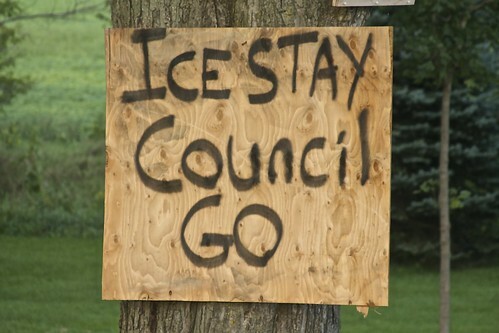 This sign was posted on the lawn of a homeowner near the Stanley Complex in Varna where council holds its sessions so that everyone travelling from Bayfield to the meeting could read it. Baker encouraged council to put the current motion on the books on hold and spend the next year doing an independent feasibility study as well as holding public meetings for community input. He also made it clear to council that no one had come to the table asking for money as BFIT thinks that they can raise the funds for a new facility privately. When the time came for council to vote on the motion regarding the permanent removal of the ice in the Bayfield Arena, Deputy Mayor Jim Fergusson addressed the gallery. Hensall Ward Councilor, Marnie Hill said she believed that the municipal staff had provided accurate, concise information that was acceptable for Bluewater. She also noted that she is not in favor of a community run hall because in the long run it would still be the responsibility of Bluewater. She also disagreed with the comment that parents won’t drive their children to other centres for recreation activities. “There is no skating club in Hensall so I drive them to Zurich,” Hill said. As a result, the Bayfield Ward Councilor took it upon himself to do some research regarding the three areas that were in question: the board and glass system and netting, the refrigeration system and the ice-resurfacer. “On Page 107 of the (Bayfield Arena – Ice Surface) report it states that the boards and glass system and netting ‘do not meet Hockey Canada Standards’. As I stated previously this is not correct. To justify my response I have since contacted Todd Jackson, director, Insurance and Risk Management, Hockey Canada. “Let’s look at Page 14 Section 1 Rule 1.2. ‘It is recommended that glass, plexiglass or other similar material be mounted to the boards, flush to the playing surface, to assist in the prevention of pucks going into the spectator area.’ So there is $120,000 of so called requirements that are not required at all,” said Whetstone. Whetstone also noted that the former facilities manager sought the opinion of Cimco Refrigeration out of Toronto, a company that services the ice of NHL teams like the Toronto Maple Leafs, with regards to the arena’s refrigeration system rather than consulting Black and McDonald with a branch in London, ON, who have been servicing the equipment for more than three decades. Black and McDonald’s report on the ice requirements stated that they have all the parts available to repair or replace the refrigeration compressor, arena dehumidifier and condenser if needed during the course of the next three years. It was noted in the report by Black and McDonald that the condenser has a history of repaired tube leaks; however, the condenser ran without issue last ice season. “It is reasonable to say that we could get the condenser through the next three ice seasons with available parts and scheduled maintenance, but it is impossible to predict failure of the unit due to its age,” Black and McDonald said in their report. The company reported that the cost to maintain the ice equipment could range from $3,000 to $19,500. They also estimated the replacement costs for all three pieces of equipment to total $125,000. According to BACPA it would appear that council is satisfied that the requested public meeting already took place four years ago under the direction of the previous council. However, in doing some research BACPA believes that the meeting that council seems to be referencing was by invitation only at the request of the then Bayfield Arena Working Committee sent out on Nov. 13, 2013. It asked that local service clubs and groups with an interest in the facility attend a meeting in the Council Chambers in Varna on Nov. 28, 2013. They were allowed to appoint one spokesperson per group. “This, in our opinion, does not constitute a public meeting,” said Keys. As a result BFIT and the BACPA are together inviting all Bluewater community residents to attend a Public Meeting regarding the permanent removal of ice from the Bayfield Arena in the spring of 2018. The date originally set for tomorrow (Sept. 14) has been postponed as the Mayor was unable to attend. A new date will be posted as soon as he provides the two groups with a date suitable to his attendance. Members of council have also been invited to attend. The letter from BACPA and BFIT was brought forth at the Sept. 5 meeting of Bluewater Council. According to BACPA, the letter of intent on the cost to purchase the arena was approved for discussion at the next council meeting scheduled for Sept. 18 at 6 p.m. in the Council Chambers at the Stanley Complex in Varna. The fall schedule of the Hensall Heritage Hall kicks off Saturday, Sept. 23 with Taw Connors' tribute to his father Stompin' Tom. Those who attend will enjoy such iconic Canadian hits as Sudbury Saturday Night, Bud the Spud and The Hockey Song. The show starts at 7 p.m. Tickets are $35 and are available from Liz at 519 262-2715 or Kathy at 519 263-2343. The Hall will welcome the Classic Country Show with CCR featuring, Elton Lammie and Wendy Lynn Snider, on Oct. 14. Tickets are $30 and available from the numbers listed above or Carolyn at 519 262-3444 or Ticketscene. Nicole Coward will entertain Nov. 2nd at 7 p.m. Coward's show features hits from such classic Canadian musicians as Gordon Lightfoot, Joni Mitchell, Anne Murray, Sarah McLachlan and more. Tickets are $25. On Nov. 19, at 2 p.m., the Hall is proud to welcome back the always-popular Larry Mercey Trio Christmas Show with special guest Cousin Clem. Tickets are $30 and will be available soon. Turkey Run Ranch, of Brussels, is teaming up with the RAM Rodeo Tour to ensure the RAM Rodeo Ring at the 2017 International Plowing Match (IPM) and Rural Expo is always in the hustle and bustle. Huron County natives Brian and Jo-Anne Workman operate Turkey Run Ranch, and will offer exciting demonstrations and competitions. The Workmans, and their crew of ten, have travelled across South Western Ontario, to different fall fairs and expos. In the Cowboy Obstacles, the Down and Back includes two riders racing horses down and back completing six different obstacles along the way. 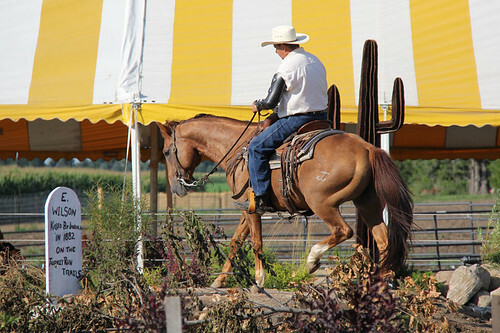 The Cowboy Trail Challenge replicates what a horse and rider may encounter on a ride through the forest. Riders will compete against each other navigating a designed pattern of fallen trees and crossing a bridge. The Birds of Prey Demonstration on Wednesday in the RAM Rodeo Ring showcases how eagles, owls, and hawks hunt and survive in the wild. The Working Ranch Demo is a 40-minute explanation of how a ranch operated in the Old West, when cattle roamed free, with no fences, barns, or feedlots. Taking care of livestock was very different then, but these old-fashioned tasks are the foundation of all modern-day Quarter Horse competitive events. Just like today, cowboys represented their Ranch in competitions, riding for their brand and bragging rights. This show will run Wednesday thru Friday. IPM 2017 will take place Sept. 19-23, in Walton, ON. Tickets will be available at the gates on the day of for $18 per person. More information about all the entertainment schedules and programming for IPM 2017 can be found online at plowingmatch.org/ipm-2017 or the Facebook Page Huron IPM 2017. 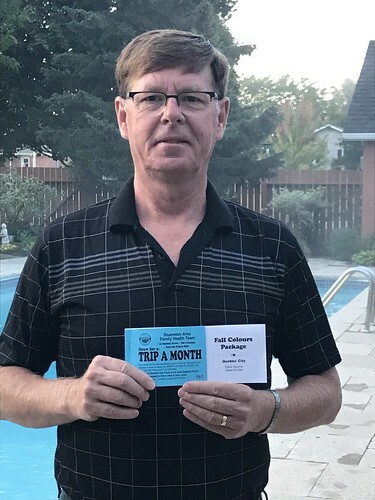 Bluewater Area Family Health Team (BAFHT) is pleased to announce that Joe Darling of Exeter, ON, was the winner of the ninth draw in BAFHT’s Trip A Month lottery. The September prize was a $1,600 Quebec City Fall Colours travel voucher package. The lottery continues with monthly draws for vacation packages to various destinations on the first Friday throughout 2017. The Trip A Month lottery is part of BAFHT’s ongoing fundraising campaign to raise over $600,000 for its building expansion and renovation project. Nearly half of this goal has been raised to date so the committee continues to look for continued support. BAFHT is a registered charity and tax receipts will be issued for donations. Please contact Paula at paulabafht@hay.net or 519 236-4413 for further details on the project or to join the BAFHT patient roster or to donate. 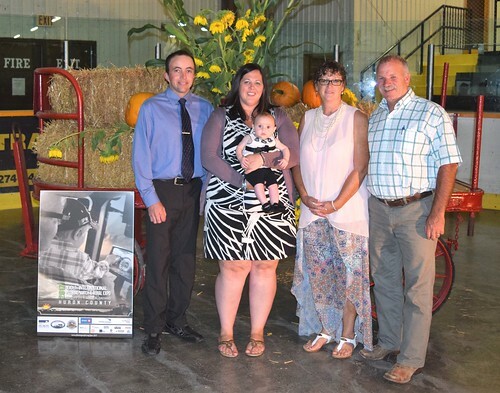 The 2017 International Plowing Match and Rural Expo (IPM 2017) Beautification Gala was held Aug. 31 at the Seaforth Arena where over 450 people attended to see the winners announced for the Beautification Competition and to see the winners of the Fan Favorite of the Huron County Barn Quilt Trail. Owner of the Host Farm of Tented City Jack Ryan received his Mayoral Chain of Office. The Ballaghs brought entertainment throughout the night. The evening also marked the launch of the Huron County Barn Quilt Trail book that compiled the photos and stories of all 164 barn quilts that were entered. The book will continue to be sold at IPM 2017 in the Souvenir Tent for $20. The winners of the Beautification Competition were: Rural Home Most Attractive - 1st,George and Ruth Townsend; 2nd, Karen and Craig Piett; 3rd, Mark and Christine Coulthard; and HM, Jan and Chris Neutel. 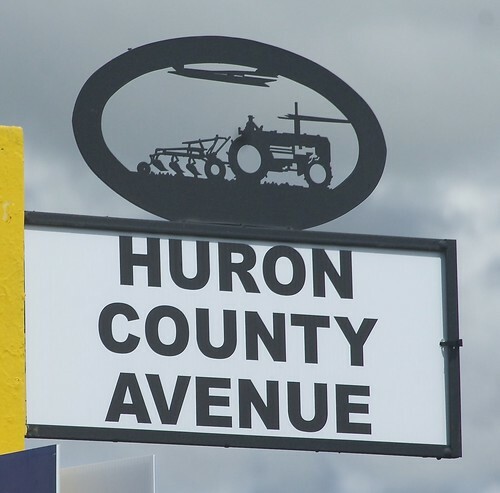 Agri-Business – 1st, Huron Feeding Systems; 2nd, Maelstroms Winery; and 3rd, EverFresh. Farmstead Most Attractive	- 1st, Doreen and Bill Taylor; 2nd, Sharon and Jim Nivins; and 3rd, Janet and Brad Bettles. Gateway Entrance – 1st, Costa Plenty Farms, Joanne and Glen Walker; 2nd, Ken Papple; 3rd, Maja and Don Dodds; and HM, Monique and Don Baan; Beautification Project – 1st, Northwoods Elementary School, Ethel; 2nd, Howick Bloomers; 3rd, Auburn Horticulture Society; and HM, Wingham Horticulture Society. Farmstead Most Improved – 1st, Nancy and Mark Kernighan; 2nd, Arletta and Steve Hallahan; 3rd, Glanville Farms; and HM, Leslie and Steve Forman. Urban Home Most Attractive – 1st, Matt and Aimee Townsend; 2nd, Marian and Frank Hallahan; and 3rd, Bob Leeming. 4-H Gatesign Award (Sponsored by Dodds Century Farms) - Jessalyn Hendriks. Fan Favorite Huron County Barn Quilt Trail Winners - 8x8, Kim and Kevin Murray; and 4x4 - Mary and Tony Vanden Hengel. The Murrays have Quilt #147 and the Vanden Hengel have Quilt #66 in the first edition of the Huron County Barn Quilt Trail Map. The map can be found online for download at http://plowingmatch.org/committees-2017-main/beautification-ipm-2017/barn-quilts. All 8x8 barn quilts will be added to the Ontario Barn Quilt Trail that can be found online at www.barnquilttrails.ca. For more information on the Beautification Award winners or if you would like to create a Barn Quilt, contact Beautification Committee Chair Deb Falconer at 519 233- 5393. Huron Residential Hospice recognizes that grief is a personal and unique response to loss. There are no universal responses or absolutes for grief and bereavement. Grief is a normal and natural response to a loss of any kind (griefrecoverymethod.ca). Huron Residential Hospice upholds the values of a confidential, safe and non-judgmental environment where grief recovery programs are available for everyone in Huron County. Jackie Simpson, Certified Grief Recovery specialist and manager of Programs and Community Engagement at Huron Hospice Volunteer Service, assesses the grief and bereavement needs of the county. After being in the education field for 28 years as a teacher and principal, she noticed that there were few supports available for families and children to help them deal with loss. Simpson and Huron Residential Hospice want to ensure that everyone has access to the grief support they need. At times, grief and bereavement support programs need to have a focus and specialty for a specific loss and population. It is important to recognize that there is no universal pathway for grieving. It is also necessary to identify the stigmatisms of certain losses such as a loss from suicide, loss of a pet and that children and teens require different recovery methods than adults. Huron Hospice recognizes these challenges and has specific programs for these types of losses and populations. “Healing the Hurt Program” is a preventative mental health initiative for youth and young adults that complement other agencies’ programs in the county. It is a grief recovery group, facilitated by a Certified Grief Recovery Specialist, which guides participants through specific and practical actions to deal with the emotional upheaval caused by a loss. It is an educational and skill-building program that promotes a safe environment and allows connections, bonding and support. In an effort to minimize unhealthy coping strategies, Huron Hospice’s goal is to equip youth and young adults with the knowledge, skills and support to handle loss in their lives. “Suicide Support Group” is a six-week program that provides a safe place for those left behind after a suicide. The stigma of suicide and the associated painful questions and emotions often leave individuals feeling isolated when they need support most. Bereavement from suicide is unique, profoundly difficult and complex. This program provides guidance through the individual’s grief process and allows participants to share and ask questions with others who have experienced a similar loss. “Grief Recovery Program for Pet Loss” is a step-by-step program for grieving the loss of a pet in a meaningful way. For a pet owner, grieving is often intense and can be an extremely difficult experience. Pets are always there when others may not be; they listen without any analysis, criticism, or judgment. It can be difficult to understand the bereavement pet owners can feel if one has not had a similar attachment to an animal. The sense of loss can be acute and very painful. “Helping Children Deal with Loss” is an educational presentation for parents, teachers, caregivers and anyone who works closely with children. Grief for a child can be caused by any number of life events such as divorce or separation of parents, death of a loved one, moving homes or schools, loss of friends, being bullied at school, etc. It is important to have the knowledge and skills to help a child handle this loss in a healthy way. Grief can have negative life-long effects on a child if it is not processed well. This program helps individuals learn more about childhood grief and gain valuable tools to help a child when loss occurs. Huron Residential Hospice understands that it is a privilege to walk alongside individuals in our community during times of grief and bereavement. It is the compassion of community members that has built the foundation of Huron Hospice and continues to uphold the vision of Huron Residential Hospice. All the kindhearted volunteers of Huron Hospice are the backbone of this organization. They believe in its mission, vision and values and will continue to provide quality and holistic palliative care support for our compassionate community in the residential hospice. If you or someone you know would like to join or inquire more about a grief recovery program, please contact Huron Hospice at 519-482-3440 Ext. 6301. 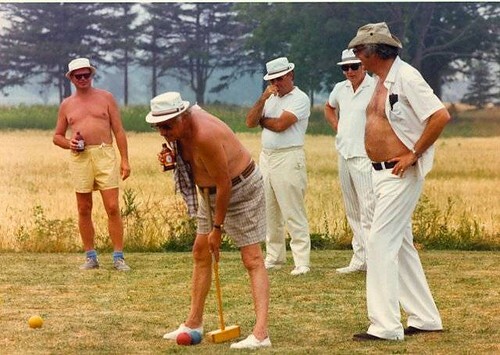 In Issue 423, an image submitted by a subscriber depicts some fun on the courts by members of the Bayfield International Croquet Club back in the days when the dress code was less formal and the beverage of choice could be found in a stubby bottle. Does anyone recognize any of the players? Tillmann, Gregory and Walters were three of the founding members of the Bayfield International Croquet Club. The photo would have been taken circa 1975. 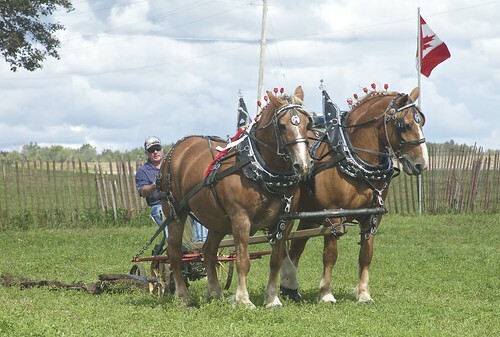 These horses could barely contain their enthusiasm to get to turning the soil during the plowing demonstration that closed out Media and Sponsor Day at the Tented City for the 2017 IPM on Sept. 6. 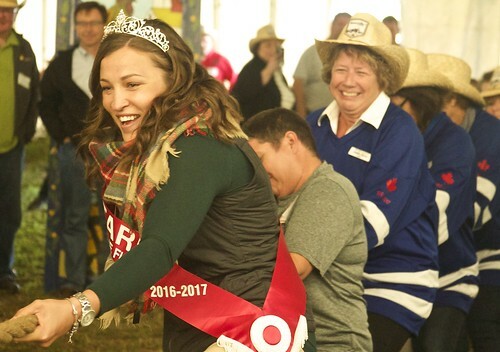 Queen of the Furrow 2016-17, Anita Rastapkevicius and Jacquie Bishop, chair of the Huron County IPM, took part in a Tug A War during Media Day on Sept. 6. 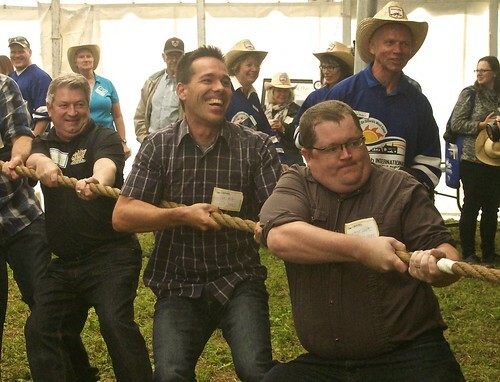 Scott Miller, of CTV News (middle); and Denny Scott, with The Citizen (right), took part in the Tug of War challenge versus their female media counterparts during Media Day at the IPM on Sept. 6. 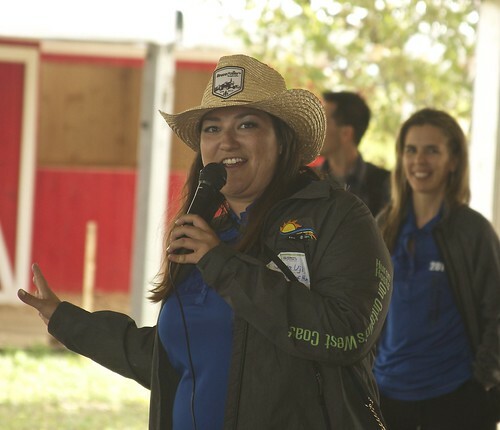 Representatives from 17 different media outlets toured the IPM Tented City on Sept. 6 along with IPM sponsors and county officials. The 100-acre tented city is mapped out complete with street names for ease in navigating. Marianna Avenue North and South which outlines the city is named after the late Marianna Ryan, matriarch of the host family. Huron County Showcase Co-ordinator, Jenna Ujiye, spoke to the media and sponsors from the Huron County Showcase Tent. Also sharing their thoughts on the IPM and the county's involvement were Huron County Warden Jim Ginn, Mayor of Huron East Bernie McLellan and County of Huorn CAO Meighan Wark. 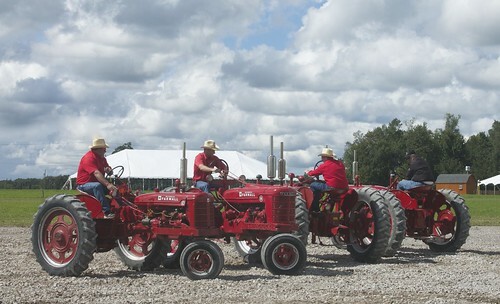 Team Farmall Dancing Tractors gave a brief demonstration during Media Day with MPP Lisa Thompson acting as their caller. This crowd pleasing entertainment can be found in Walton Square with performances twice daily during the match. A plowing demonstration showing how the process has evolved in the last 100 years closed out Media Day. Want a sneak peek of the site too? Folks are invited to attend a nondenominational church service Sunday, Sept. 17 at 3 p.m. on the IPM site. The 100th edition of the largest farm show in Canada will be held in Walton ON on Sept. 19-23. On Sept. 6, organizers of the International Plowing Match (IPM) and Rural Expo 2017 invited members of the Media and Sponsors to tour the Tented City in Walton, ON and the Bayfield Breeze was there! 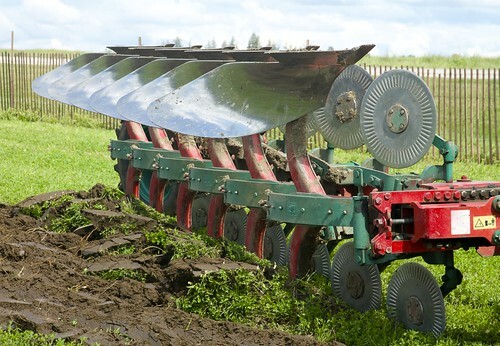 The Media were assigned to IPM Executive members to tour with, encouraged to take part in a Tug-of-War and invited to try their hand at plowing by hand. All in attendance were treated to a locavore lunch prepared by Chef Devin Tabor, as well as refreshment samples from Cowbell Brewery and Maelstrom Winery. 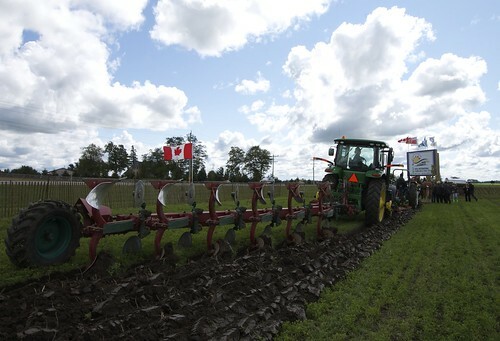 Those in attendance also participated in a flag raising ceremony, got a sneak peek at the Huron County Showcase Tent and viewed a plowing demonstration from the days of horse to present day. The following are a few fun facts that make the 100th IPM, and the fifth one to be hosted along Ontario’s West Coast, unique. •	16 young women will compete in the first ever Princess of the Furrow Competition. •	5 years in the making – IPM 2017! 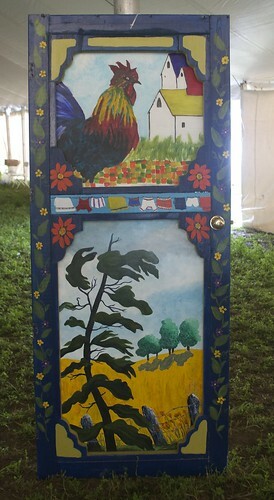 The Beautification Committee looked to the talented artists around the county to paint 64 old doors to help conceal the unsightly, but necessary, hydro poles on the match grounds. The results are some fabulous folk art! 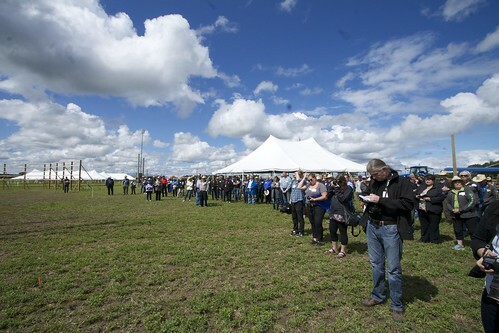 Media Day included a stop at Tented City's Mutual Square for the official raising of the Canadian Flag that will fly over the site for the week of the IPM. Cindy Fischer told the story of the flag that once flew from the Peace Tower in Ottawa. It was donated by a Huron County family who had signed up to receive a flag over a decade ago. 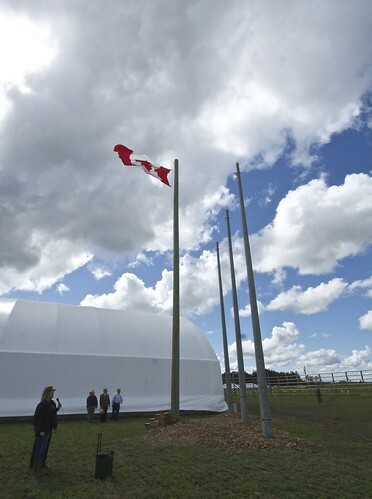 The substantial size of the flag warranted a very tall pole which the IPM organizers made happen. The flag was raised by MPP Lisa Thompson, Jack Ryan, owner of the Host Farm of Tented City; and Bill Strong, representative for Huron-Bruce MP Ben Lobb. Owner of the Host Farm of Tented City Jack Ryan received his Mayoral Chain of Office on Aug. 31 at the Beautification Gala. He wore it proudly on Media Day Sept. 6. Sept. 6, 2017 I had the opportunity to tour the Tented City for IPM 2017 to be held in Walton next week. The media were paired with members of the IPM Executive and I was matched with Karen Redmond, chair of the Beautification Committee. At lunchtime she asked me if I had, had much involvement with past IPMs. I explained that the first one I had been too was actually the event in 2013 near Mitchell. I also mentioned I had helped with the Queen of the Furrow dinner hosted by the Bayfield Agricultural Society in 1999, when the IPM was held in Dashwood, as my Pathfinder unit served at the meal. And I remembered my parents going to the one in Wingham in 1978 but as it was a school day I wasn’t allowed to go. This sent the conversation on a bit different path as we both noted how great it was that there is now an Education Day at the IPM (Sept. 20) where area school children are welcome to attend. 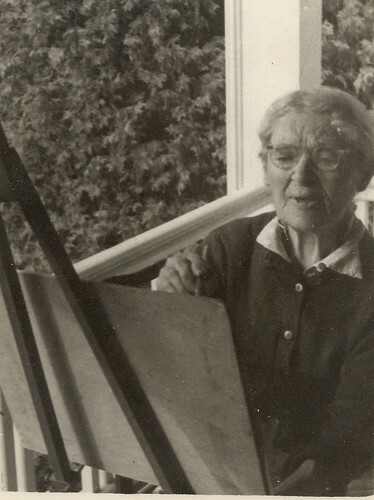 She noted that as a youth she and a cousin were all set to go to the IPM in Seaforth but then at the last minute they weren’t able to go because it was too muddy at the site.